Solar, being the most talked business in town is now admired by most people for its clean and continuous source of energy (The Sun). Kyoto Protocol program recognizes clean source of solar energy to the most and provides carbon credits points based on the carbon reduction by the methodology. Being experienced in the engineering industry as machinery manufacturers for 22 years, the intension of expanding the business line has given us new horizons in the field of clean energy. 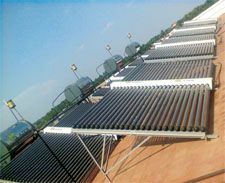 Glazer solar energy private limited is formed with better ideas and innovation in the field of solar water heaters and photovoltaic modules. Besides subsidies and new businesses, the intension of the company is to provide the consumers with better products by carefully taking note of the technology and the quality limits that could be achieved in the field of solar.